How Do You Seal Basements and Keep Water Out? Waterproof coatings and membranes: a first line of defense in a waterproofing system. What went wrong? Waterproof membranes and paints can't provide total waterproofing protection because they don't stop water from leaking into the basement along the wall/floor joint. Waterproof coatings and membranes attempt to to prevent water from entering in by creating a protective waterproof seal. At best, sealing is a first line of defense, not a complete solution. Despite today's high-tech materials, sealing does not provide permanent protection against every type of water intrusion from every possible gap or crack in a basement. As hydrostatic pressure increases, so does the potential for a leak. Water weighs about 60lbs. per cubic foot. 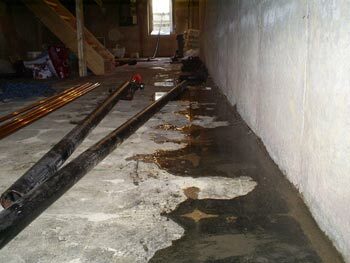 When wet weather causes the soil outside your basement to become saturated with water, hydrostatic pressure against your foundation increases by thousands of pounds. A waterproof membrane or coating can succeed in preventing water intrusion across most of a basement wall surface. But with high hydrostatic pressure, even a small crack or gap can admit a significant amount of water into your basement. It's also important to note that membranes and paints can't do anything to seal the crack that runs between the basement wall and the concrete slab floor – a major source of water leaks in most basements. Taking a realistic approach to basement waterproofing means paying attention to different systems and strategies that can work together. Used in combination, the methods described below provide the best protection against unwanted water in the basement. Direct water away from your foundation. Give your basement waterproofing system a fighting chance by encouraging water to drain away from your foundation. Make sure gutters and downspouts are functioning well to avoid backups and overflowing water that collects near the foundation. If necessary, install splash plates or downspout extensions to transport roof runoff away from foundation walls. Repel water with membranes and/or coatings. While you can't expect total waterproofing protection from a membrane or coating, this treatment can limit the amount of ground water that penetrates through masonry walls. Install an interior French drain and sump pump system. WaterGuard® drains connected to a TripleSafe® sump pump will provide the best protection against water in your basement. Unlike membrane and coating treatments, the WaterGuard® interior drainage system can deal with water that leaks into the basement along the wall/floor joint. Instead of allowing hydrostatic pressure to build up around your foundation, the WaterGuard® system alleviates this pressure by capturing water before it reaches your basement floor and then pumping it to the exterior.